A Latin name for wormwood (also known as absinthe) is Artemisia absinthium L., given in the honor of Greek goddess Artemis. It is a plant that in the past was widely used to ease the labor pains and Hippocrates himself prescribed wormwood as medicine for pain, amnesia, and rheumatism. Wormwood is a perennial plant herb with branched stems and yellow plants. The leaves and flowers of wormwood are characterized by bitter and aromatic flavor which are harvested predominantly at the end of August. It grows in warm and wide waste areas, mostly along forest paths. It can reach up to 1.25 m in height and wormwood stems are grooved and branched above. Stems and leaves are covered with silky white-grey hair. Wormwood tea is to be taken in small amounts up to a week since consumption of larger amounts of wormwood tea may cause headaches and lightheadedness. But, wormwood combined with the sweet flag (also known as calamus) effectively treats digestion and urinary problems. 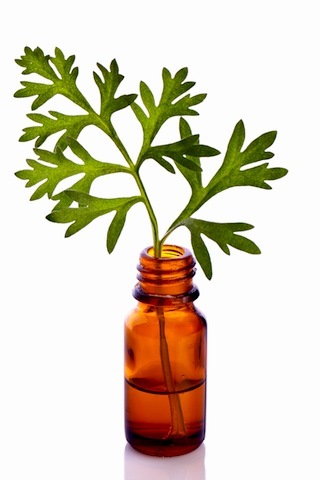 In the case of liver problems, jaundice and stomach pain wormwood should be taken with plants centaury and currant. Drinking wormwood tea helps ease bloating problems and it is an effective remedy for fever and purifying the blood. However, wormwood gained its popularity thanks to anti-parasitic property and it works well not only against adult parasites but against their eggs too. Wormwood tea should be taken in small sips and it can also be helpful for people with diabetes, rheumatism and anxiety disorders. Wormwood powder made from dried leaves and flowers is recommended for use by people who have gastrointestinal problems (particularly related to the liver and stomach) or have anemia. The recommended dose is ¼ of a teaspoon which should be taken after lunch and dinner. Wormwood tincture is an excellent remedy for stomach pain, so if you frequently suffer from nausea, it is good to have it close at hand. Wormwood compress helps heal open wounds. Absinthe has long ago become popular as herbal, highly alcoholic beverage which is taken in the dose of one small liquor cup before a meal. However, wormwood taken in higher doses can have toxic effects, but in a smaller dose, it is harmless. Wormwood has the reputation as powerful natural medicine. For the most part, wormwood is something you should have close to your garden because it’ll protect fruits from various parasites. Note that any type of wormwood beverage is prohibited for use during pregnancy, breastfeeding, and gastrointestinal bleeding.